“How might your life have looked if you were born a man?” Heather Belnap Jensen (MA ’97) asks her 16 students. Hands go up in the second week of Intro to Women’s Studies. One student notes she might have mowed lawns in her youth rather than vacuumed carpets. Another says she would feel more pressure to choose a major based on supporting a family. Belnap Jensen points out that men usually don’t think twice about running after dark. All are welcome, but a glance around the classroom yields all women, some simply taking the class to fill a general-education requirement—the class recently landed on the list of BYU’s core class offerings. Readings range from Betty Friedan to the Family Proclamation, as the class explores a broad spectrum of female perspectives, contributions, and challenges. Students examine developments from the formation of the Nauvoo Relief Society to Ellen Johnson’s election as Africa’s first female head of state. 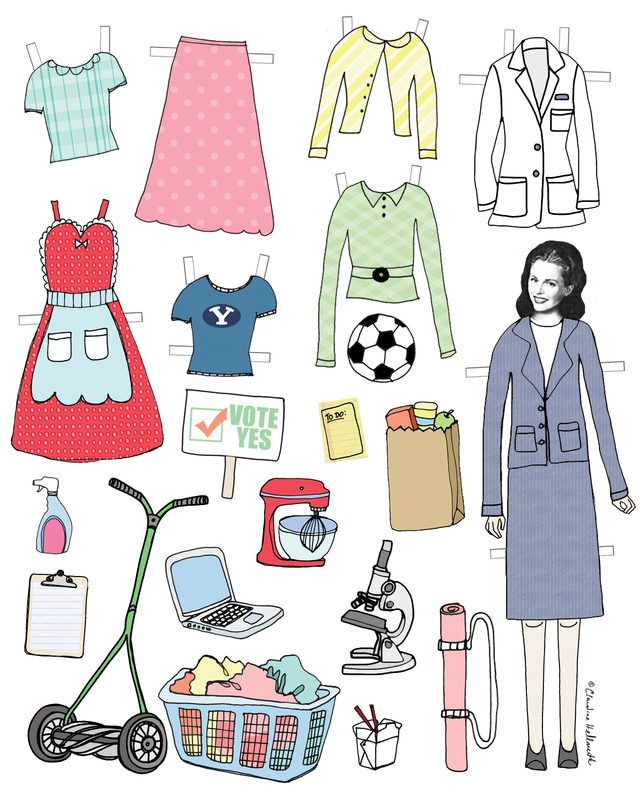 Professors on BYU’s Women’s Studies board rotate teaching the class, lending different lenses to material. One semester, led by a sociologist, may be statistics heavy. Belnap Jensen, an art history professor, likes to emphasize how art, fashion, and advertisements affect women’s issues. In one exercise, students sit in the quad writing unfiltered word associations about passing female students. Most assess physical appearance, writing things such as “Plain-looking” or “Good sense of style. I wish I had her everything.” An outlier, says Belnap Jensen, reads, “Attentive. Aware. Curious. Smart,” and represents the shifted perspective the class encourages: viewing women as subjects rather than objects and increasing awareness of the barrage of societal messages objectifying women. Vocabulary is central to the course. Belnap Jensen deconstructs loaded terms like “feminism.” “It was cool to watch some of the girls in my class realize that feminism is not misandry”—or male bashing—says student Alyson C. Ludlow (’17). “Feminism is egalitarian in nature.” Students learn how women have sought political, social, and economic equality—such as rights to vote, attend school, own property, and more—and how such rights lag in many parts of the world. While teaching about feminism’s history, Belnap Jensen discusses the more than two dozen branches of feminism today. Belnap Jensen draws parallels with the Church’s teachings about gender equality, which focus on genders complementing each other rather than gender difference or sameness. Relational feminism, one of the branches of feminism discussed in class, emphasizes relationships between individuals as empowerment and holds that equality can be realized when attributes that have been deemed feminine, such as being nurturing, compassionate, or empathetic, are affirmed. “[Feminism] might be equality through difference, or gender complementarity,” says Belnap Jensen.